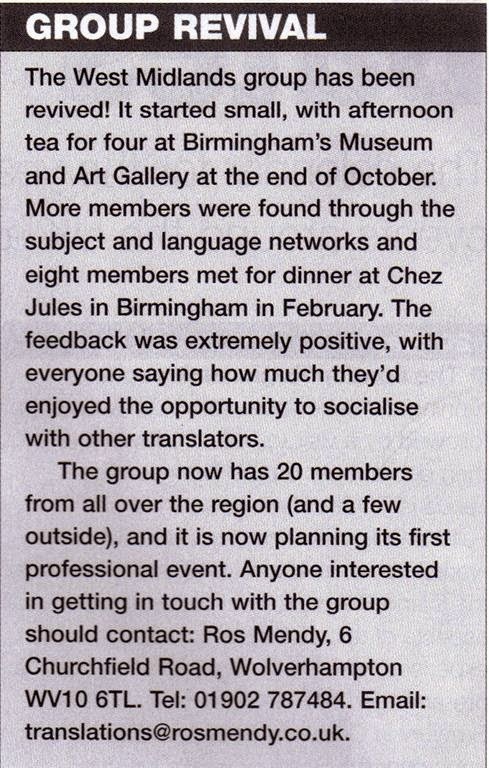 The WMG was reborn on 31 October 2004 when four local translators (Ros Mendy, Aileen Nicholson, Sally Flavell and Jo Beckett) met in the Birmingham Museum and Art Gallery tea room. Ten years later, in December 2014, the current committee assembled for a meeting in the same tea room and celebrated the group's tenth anniversary over a mug of glühwein in the German Christmas market. 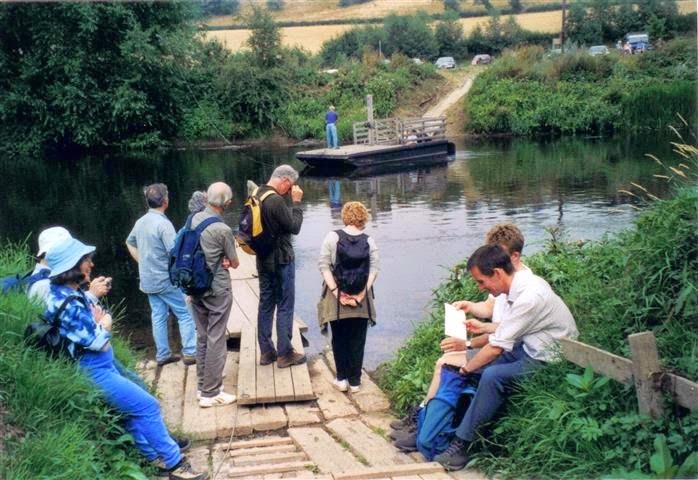 Soon afterwards, Mike Hanson led a group of us on a delightful walk around Highley and Hampton Loade in Shropshire, which involved a memorable trip across the River Severn on a pedestrian cable ferry propelled by the river current. Mike subsequently offered to organise another walk the following January. 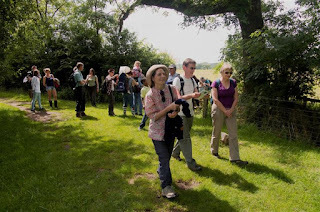 And then another the summer after that, and soon the WMG walk had become established as a regular, twice-yearly event. The 20th WMG walk will take place in summer 2015. We started 2006 with a 5-mile walk around Henley-in-Arden, organised by Mike Hanson, while Charlie Gobbett led a shorter version suitable for small children (young Will was just 3 at the time and Mimi was 4). 2006 was the year the WMG held its first ever committee meeting (at the Brasshouse Centre in Birmingham), agreed on a constitution, opened a bank account and set up a website. Two of the people at that first committee meeting are still in the same roles in 2015: Charlie Gobbett has been our Treasurer since 2006 and Mike Hanson has been organising walks since 2005! 2006 also marked the start of a fruitful, long-term collaboration with the Translation Studies Department at Aston University. The first joint WMG/Aston event was Translators' Question Time, which took place at Aston University in May 2006. Christina Schaeffner, Director of Translation Studies at Aston University. 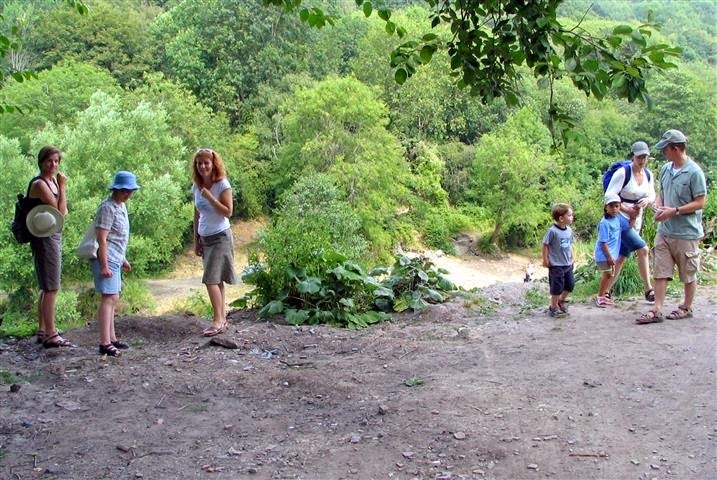 In July 2006, Mike led a sunny, 6-mile hike around the Ironbridge Gorge, and once again Charlie led a shorter child-friendly walk. We made it back to the Meadow Inn for dinner just before a tremendous summer downpour. In October 2006, the WMG and Aston organised a joint workshop with the ITI's German Network. Sue Young led two sessions: one on translating European documents and references, and one on revising translations. There was also a session on working with direct clients, led by German conference interpreter Dorothea Dahl, and a talk by Christina Schaeffner of Aston University on how to approach a translation task. at Michelle's La Bastille restaurant on Corporation Street after the workshop. For those who'd decided to make a weekend of it, there was a visit to the back-to-back houses in Birmingham the following day, with an extremely realistic ghost and apple bobbing for the children. 2007 was a fantastic year for the WMG. We started the year with a 6-mile walk up into the Malvern Hills. Then in February we organised an ITI 20th anniversary event at the Studio in Birmingham. The buzz surrounding this workshop was amazing and we welcomed participants from all over the country. The colourful, comfortable venue certainly helped, as did the energy of the two speakers: Nick Rosenthal gave a thoroughly motivating and practical talk on marketing and customer relationships, and Vernon Blackmore explained the various approaches to building websites and the pros and cons of DIY and professionally designed sites. Those who were still around the next day were treated to a wet but fascinating tour of Birmingham’s Jewellery Quarter with Chris Upton, a local historian, including a visit to the Pen Museum. The WMG held its first AGM in April 2007. The venue, Soho House in Birmingham, is the former home of Matthew Boulton, who used to host meetings of the Lunar Society there in the 18th century. In the summer, the WMG ran a joint workshop with ITI’s French Network on assertiveness skills, led by trainer Ruth Sacks. The event was held in the wood-panelled Shakespeare Memorial Room at the old Central Library in Birmingham. Since then, this entire room has been dismantled and reassembled on top of the new Library of Birmingham, where it is open to visitors. The same month, several WMG members met at the Black Country Museum with their partners and children for a family day out. In July 2007, Mike Hanson organised a 5-mile walk starting from Shugborough Hall. Then in the autumn, as the Translation Department at Aston University welcomed its new intake of MA students, Ros Mendy rashly agreed to go and talk to them about the WMG and life as a freelance translator – despite having two small children and no one to look after them. This incident is vividly recalled (second comment below this post) by Jean Darvill, one of the students who attended the event. Every cloud has a silver lining though: Jean joined the WMG soon afterwards and later did a 3-year stint as WMG coordinator (2009-2012). 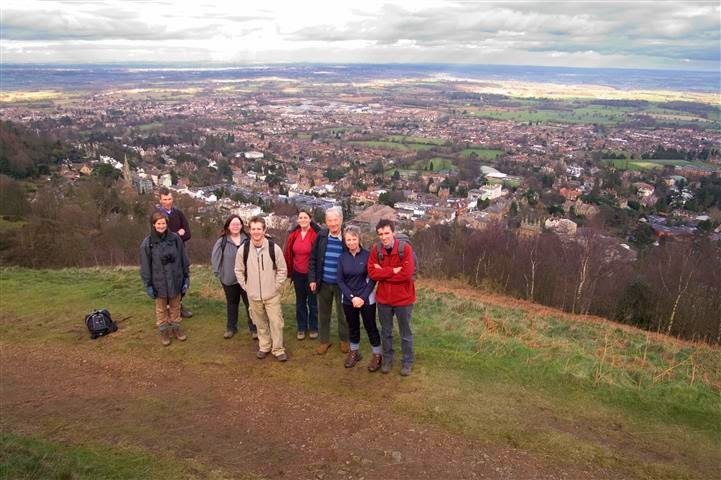 In January 2008, Mike Hanson led a walk along Kinver Edge with its fascinating rock houses and we were joined for the first time by Jean Darvill (WMG coordinator 2009-12). In spring 2008 we were back at Aston University for a one-day event on selling translations and an introduction to TM (led by Doug Lawrence, with some help from Charlie Gobbett). Coincidence or consequence? 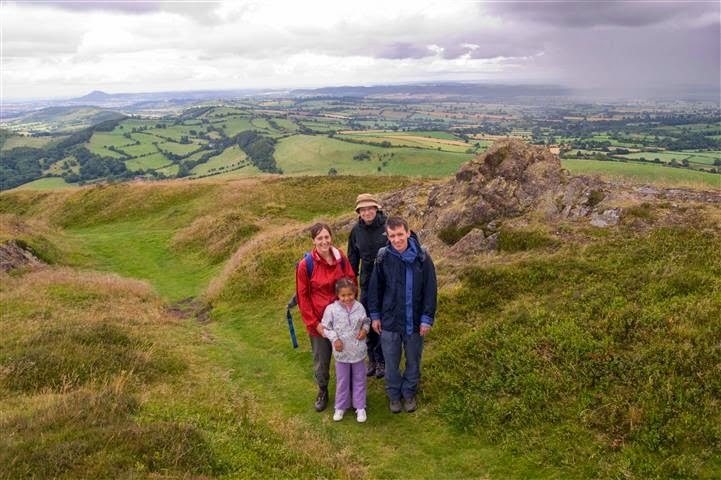 The summer walk that year featured the steepest climb and the smallest turnout of any WMG walk before or since: only four of us joined Mike Hanson in Church Stretton for the climb up Caer Caradoc. Among the intrepid hikers was 6-year-old Mimi, whose performance prompted this comment from Matt Young on the e-group the following day: “I’ve never seen a 6-year-old walk so far and eat so much in one afternoon”! In the autumn, the WMG and Aston Uni helped organise the German Network’s annual work & playshop, which covered contingency planning (Doug Lawrence), subtitling (Rosi Jillett), translating websites (Doug Lawrence) and specialising (Janet Fraser). There was a dinner at Chez Jules afterwards and, for those who were still around on the Sunday morning, there was a rainy but fascinating tour of Birmingham’s Gas Street Basin with local historian Chris Upton. In January 2009, Mike led a walk around Lapworth, taking in a stretch of the Grand Union Canal, which was extremely muddy following a downpour the night before, and some enormous bearded goats. Having had just five walkers for the previous walk, we had a record attendance of 22 people for this one, including Mimi (7) and Juliet Hammond-Smith’s daughter, Elizabeth (13). Someone from the Pensions Advisory Service came to Birmingham to talk to us in 2012 about planning for retirement and the following day, Doug Lawrence led a workshop on sales and marketing for freelance translators. At the AGM, Ros Mendy, stood down as Coordinator and was replaced by Jean Darvill, who ran the group until 2012. The summer walk took us over the Bromyard Downs around the Brockhampton estate in Herefordshire. This time we were joined by Matt Young’s son, Tom, who was just 5 months old. Later the same year, the WMG welcomed back Nick Rosenthal and Doug Lawrence for a one-day workshop at Aston University on keeping your customers happy and staying healthy. At the beginning of February 2010, Mike led a walk around Cannock Chase for a group that included five children. In the spring, the WMG organised an afternoon of talks and discussions in conjunction with Aston University: Spencer Allman talked about revising translations and a panel of local translators and interpreters discussed a range of interesting topics, including office sharing, free translators’ software and informal interpreting. In July 2010, Mike led a walk from Winchcombe in hot sunshine through beautiful scenery, with a stop for a picnic and some frisbee-throwing. Later the same year the WMG organised another joint event with Aston University: a meet-the-ATC event followed by a workshop on website translation run by Doug Lawrence and Lone Behesty. An article by Ros Mendy that appeared in the ITI bulletin in 2011 on ITI’s regional groups found that there were 106 ITI members living in the West Midlands region, of whom 36 were members of the WMG (plus a further four non-ITI members). 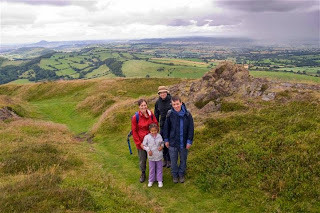 In early February 2011 Mike led 14 of us on a blustery walk from Cleobury Mortimer, and in July took us to Wenlock Edge. For Mimi (9), this was the 12th WMG walk she had been on and she wrote a report on it for the Bulletin. Also in 2011, Juliet and her husband Bryan organised a wonderful garden party and BBQ in their beautiful garden in Solihull. The WMG was proud to host the 2011 edition of ITI’s annual Translation Workshop in conjunction with Aston University. The day of practical translation exercises and discussions was followed by a visit to Bournville and the Selly Manor Museum on the Sunday. In December 2011, Dr Jean-Pierre Mailhac was invited by the WMG and Aston University to run a workshop on translating business film material. In early February 2012, Mike led a walk around Bewdley. Snow started falling during the afternoon and quickly transformed the countryside into a fairy-tale landscape. It also caused problems on the roads so that some of us very nearly found ourselves stranded in Bewdley overnight. In March 2012, we were delighted to have a chance to listen to Chris Durban, who gave a talk at Aston University on “finding work with premium clients: the pleasure ofgetting your hands dirty”. The following month we ran two workshops at Aston University in conjunction with our AGM: a morning workshop on financial translation led by Javier Gill and an afternoon talk on the increasing use of controlled and simplified versions of English by technical writers and translators, given by Dr Stephen Crabbe. This was followed by a demonstration of Trados software by Charlie Gobbett. At the 2012 AGM Jean Darvill stood down after three years as WMG Coordinator, and was replaced by Juliet Hammond-Smith. In July 2012 Mike and Angela Goley (from the newly formed East Midlands Group) led a joint EMG/WMG walk from Calke Abbey in glorious sunshine. At the end of the year, the WMG and Aston University invited Jean-Pierre Mailhac back to Birmingham to run a workshop on translating cultural references. 2012 was also a very sad year for the WMG because it was the year we lost Anne Hulme, an active member of both the WMG and the NWTN, who had been extremely generous with her support and advice when the WMG was first setting up. When heavy snow was forecast for our planned walk date in January 2013, we postponed it to early March, when we enjoyed unseasonable good weather in the Lickey Hills. For the first time in 8 years, Mike was unable to lead us because he was away on an interpreting assignment, so Charlie Gobbett took us along Mike’s planned route across fields, along country lanes and through woodland, bringing us back past the Tardebigge reservoir and up the canal towpath just as the sun was setting. Mike was back with us later in the year for the summer walk around Grinshill and Clive in North Shropshire, starting in Corbet Wood, with a dozen walkers, including WMG members, partners, one child and a dog. The WMG decided to organise its first mini translation workshop in 2013, following the format of ITI’s annual translation workshops. With a mixture of practising translators and MA students, the discussions were lively as we discussed ways of conveying the delights of “snail porridge” from The Fat Duck Tasting Menu into other languages. It was generally agreed that “Schneckenschleim” sounded even less appealing than the English version. 2013 was also the year we launched the WMG mentoring scheme for MA students at Aston University. Students were paired up with practising translators and offered a chance to visit them at home, see how they work and ask questions. In November 2013 Aston University ran an afternoon workshop for WMG members on the basics of CAT tools, including Cloud-based programs. We ended the year with glühwein at the German Christmas market in Birmingham. On 1 February 2014 Mike led us on a windy, muddy walk from Tanworth-in-Arden. Later in the year, some WMG members attended a workshop on financial translation at Aston University led by Javier Gil. 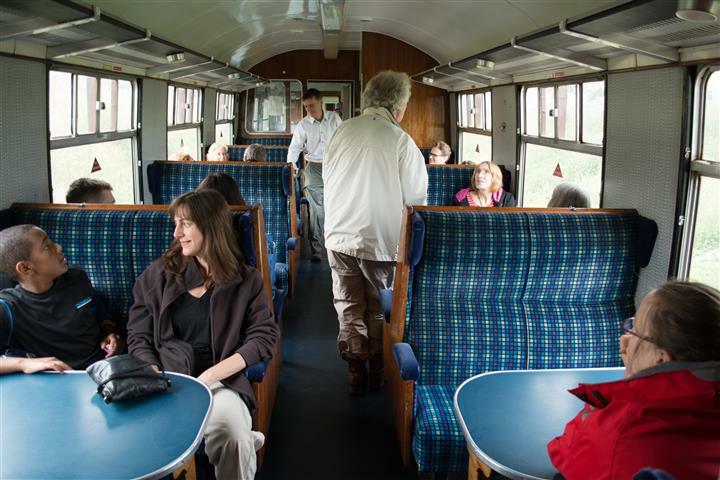 In early September, we had better luck with the weather when we teamed up with members of the Western Regional Group for a joint WMG/WRG walk that started with a trip on a steam train from Toddington to Winchcombe. A presentation in October by Susan Lankfer, Head of Business Development at Comtec Translations, provided insights into the services that Comtec offers its clients in addition to translation. The WMG celebrated its 10th anniversary in December with lunch at the Birmingham Museum and Art Gallery and a chat over a mug of glühwein in the German Christmas market. Looking at the photos though, reminded me that in the past 3 years we have lost both Anne Hulme and Sue Young, two ITI stalwarts and giants of the profession. I still miss them both. My first encounter was at a meeting organised by Christina to introduce me and my fellow students in Aston University's Translation Studies department to our local ITI organisation, the WMG, as represented by Coordinator Ros – what better introduction! An occasion Ros may remember as frustrating and embarrassing, brought me great relief and opened many doors. It happens: Ros had to appear professionally competent with a 3 and 5-year old in tow. Alan was simmering from the word go and even the usually reliable Mimi couldn't resist joining in after a while. Whispering in a corner at the front gradually became talking and laughing loudly, while Ros, having tried patiently warning, pleading, finally banned them to the corridor, which they proceeded to charge up and down, shouting loudly – great fun! However, the effect on me was one of relief and delight. Here at last, after 4 weeks or so of feeling very out of place amid students the same age as or younger than my sons, here at last was was someone I could identify with – I'd been there and 'suffered' too. It didn't take me long to join and by January I was out on one of Mike's walks and getting to know more translators of all ages, all of them very helpful and friendly. And that was just the start: from there I joined the ITI, followed by Gernet, later Frenet and more. And it's been largely the translators and students I've since got to know who are, directly or indirectly, responsible for bringing me work and clients and teaching me the 'do's and don'ts' of professional translation. And all thanks to Ros (not forgetting Alan and Mimi) and that first meeting – and of course, the WMG! I remember that day so well. I’d let Christina persuade me that it would be “fun” to bring my children along (well, it was definitely fun for the kids…) and I didn’t have anyone I could leave them with. But then, if I hadn’t gone, maybe the WMG wouldn’t have found you, Jean. It was definitely worth the embarrassment to find the WMG's second coordinator! 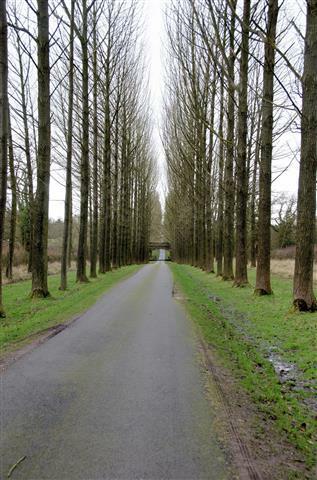 The walks are the most vivid memories - thanks for your inspiration Mike! Thanks Charlie - see you in July for no. 20. Looking at the record for 2007, Soho House (located in what is now a rather run-down inner-city area) was a fascinating venue for the AGM, and we learned a lot about Birmingham's origins as an industrial city. Maybe we should consider some similar alternative locations for our AGM? (though it means paying for room hire and they may not be easy to get to by public transport....).